We all had a great day floating about on giant inflatable thongs, watching the fellas lollop about playing beach cricket and breathing in the smell of cooked meat and onions as Jamie Oliver-wannabes sizzled not only sausages but their shoulders in the beating sun. 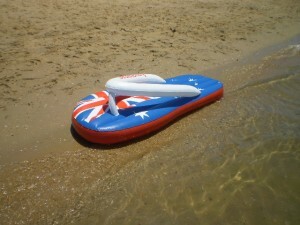 Yes, Australia is certainly a country that loves to celebrate – and many parents will have even more reason to celebrate tomorrow, as the countries schools re-open their doors to a new school year. I have to say, I’m not one of those parents… I’ve thoroughly enjoyed the last 6 weeks with my three pals. It’s been a never-ending cycle of snorkeling, bike riding, swimming, boating (round Richard Branson’s island! ), beaches, ice-skating (I know!) movie-going and generally larking about. I suppose I should have taken the kids with me really…? We’ve had a great summer but now the work really begins – with all three kids at different schools with different start times, and different tastes in lunchbox menus… I’m already looking forward to the next holidays. Have a great week. x. 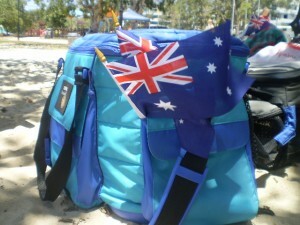 This entry was posted in blog, Living In Australia and tagged amber nectar, Australia Day, beach cricket, esky, sausage sizzle, thongs, true blue.